I would greatly appreciate some help!!! I'm pretty good at decorating, but I am stumped here. I recently purchased a home with a huge family room, and don't have a clue where to put furniture or how to decorate it. Its size is 19' x 27' and has vaulted ceiling that reach 14' and higher which makes it look even larger. The room seems empty and uninviting. I'm sure I don't have enough furniture to fill the space, but don't know what I need. One corner of the room has a fireplace, and two other walls are pretty much filled with doors. 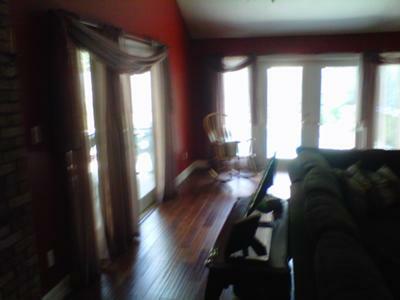 There is a huge entertainment center, which has to stay, that takes up a third wall. I also have a chocolate brown sectional sofa that can only be positioned certain ways because one of the sofas has only one arm. Where it is currently placed it is blocking the view of the fireplace. Two walls have doors pretty much filling them. My floors are walnut hardwood. I have sheer curtains up on the door, but don't like them. Not sure if they are the right style, or if I even need them. I have painted the room three different colors (trying to coordinate with the brick fireplace), and just can't seem to get it right. 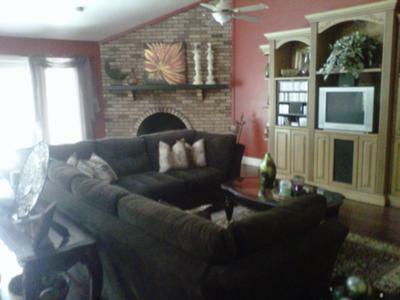 I like deep rich colors in my home, but I'm not sure the red I have is the right color. 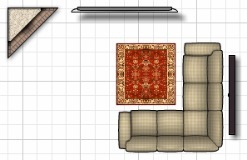 I know I need to break the room up into different spaces, but don't know how. I would appreciate any help you could give me. 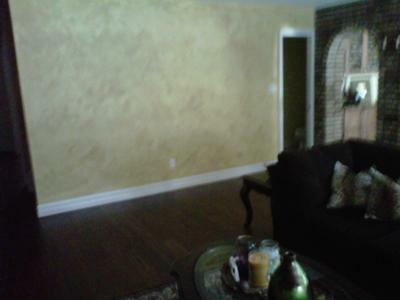 Thank you for getting in touch and for including the photos of your family room. I suppose part of the answer lies in the question - what is the room used for and who uses it? I'm not sure if there are children to consider or whether this room needs to double up as an area for eating for example. I'll assume not as I can't see any evidence of this. The first thing I would do is pivot the sofas around so the seats are facing the entertainment center, fireplace and window. sure without seeing it in real life but are you being a little hard on yourself? You say that you are not keen on the sheer curtains you have and I'm wondering if they are necessary? The fact that they are not a more solid fabric suggests to me that they are not needed for privacy and if that is the case I would get rid of them. I see that you live in Florida so presumably you don't need curtains for heat so are they purely for decorative effect? If that is the case I would suggest either leaving the windows unadorned except for perhaps a padded pelmet to take the bareness from the top of the window or maybe opting for wooden shutters or wooden venetian blinds. I think that one of the main things that is making the room look bare is the totally plain wall you have and definitely something needs to be done there. You don't want something that sticks out too much here but you do have several options. You could opt for some vinyl wall decals which would certainly add interest to the room without being too intrusive or overly expensive. Another option would be making a fabric wall panel with a fabric that you like and really, while you are at it you could make a couple of pillow covers to go on the sofa to tie it into the rest of the room nicely. You may also like to think about using rugs as wall decor which gives a really nice effect. Buying a piece of art for this wall is a good idea but the wall is so big that you would need to buy a very large picture or the proportions will look wrong. If there is a picture you really like that is a bit too small you could try painting a co-ordinated panel behind the picture which really helps to give the illusion that the picture is bigger than it actually is. Finally, you could opt for a practical use by adding some shelving to this wall although I would suggest you add a mixture of books, ornaments and framed pictures to the shelving as shelves full of solid books can look too heavy and a little overwhelming. Good luck Annmarie - I hope you end up with a room you love.